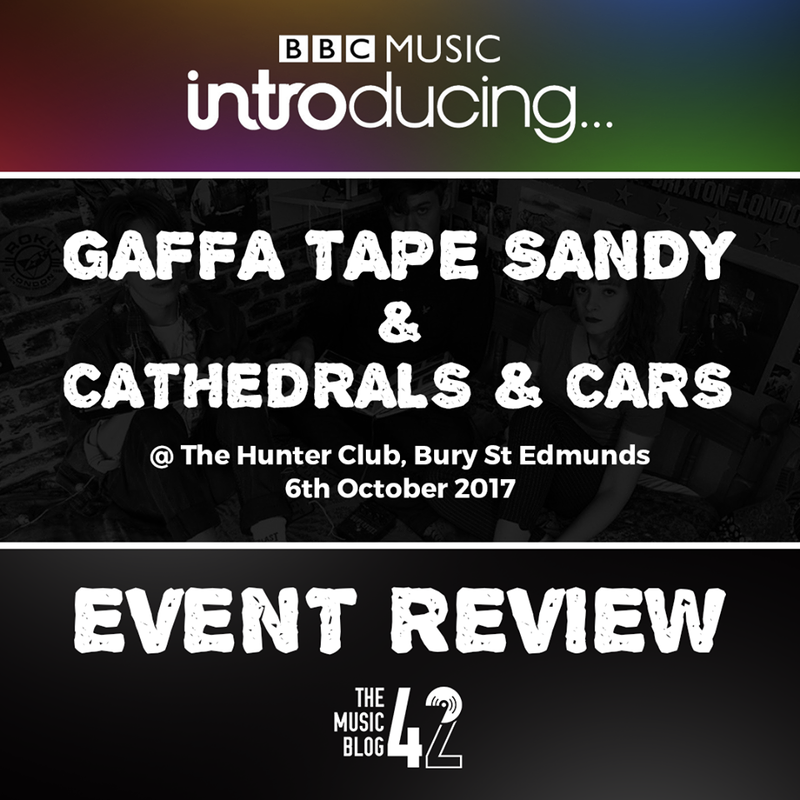 The 10th anniversary of BBC Music Introducing was celebrated at The Hunter Club in Bury St Edmunds on Friday evening (6th October) with interviews and sets from two of the biggest BSE bands, Gaffa Tape Sandy and Cathedrals and Cars. The night kicked off with short sets from each band, and interviews conducted by the one and only Graeme Mac, with this part of the night being broadcast live on BBC Radio Suffolk. Click here and listen to the show! Cathedrals and Cars were up first with their full live set and wowed the slowly-filling room with their incredible art rock sound. Highlights of their 30-minute set were the set opener Elevator, the lively Art School and the pleasing The Concierge. The band is currently in the midst of releasing new material, and it’s hotly anticipated since they haven’t released an EP since early 2013, though they did tease a new track called Wheeler Street, which as always sounded amazing. The real highlight of the night was the exhilarating A Piece Of Me Died In Europe, arguably the band’s best track, a darker track than usual but showcases the band’s intelligent songwriting and electrifying riffs. Gaffa Tape Sandy closed the night with an emphatic set which proved they are the best band in Bury St Edmunds right now, what with coming off the back of playing the Introducing stage at Glastonbury this year. Opening with the classic Smart Dressed Guy (in which frontman Kim Jarvis broke a guitar string) and the acclaimed Water Bottle, the packed crowd moshed and crowd surfed all set long to the euphoric garage rock beats on display. Other highlights from their set include the pounding Transylvania and Pink Neck/Train Wreck, both tracks from their recent EP Spring Killing. The band were quick to shout out their manager Joe Weaver, and present Graeme Mac with a cake to celebrate the 10 years of BBC Music Introducing. The band were supposed to finish with the absolutely huge Beehive, though were called back onto stage by the baying crowd wanting another track. Coming back out, they played another song from Spring Killing, the smooth Collarbones. An incredible night of live music, but a thankful reminder that without people like Graeme Mac, and the incredible people at the Washing Machine and Hunter Club, there would be no music scene in Bury or even in Suffolk. The next Washing Machine event is Saturday 21st October where Dingus Khan headline The Hunter Club, with support from Sun Scream and KYANOS! Gaffa Tape Sandy’s new single Beehive is out 20th October, and will be available on all streaming services and iTunes!